Shop for authentic replica First Navy Jack flags. Our First Navy Jack flags are constructed of durable nylon with a canvas heading and offered in five sizes. The First Navy Jack is flown by the United States Navy across the world. It is a symbol of the USA's campaign of The Global War on Terrorism. As such, it has been hoisted by US Navy vessels since 11 September 2002, a year after the attacks of 2001. It is the official navy jack, which is a naval flag used while vessels are at anchor or in harbor. The jack is flown at the front (bow) of vessels, while the national ensign is hoisted at the rear (stern). It is hoisted on the jackstaff, which is a relatively small pole (spar) on the very front of all commissioned vessels. This includes submarines. A variation of the USA's national flag, the First Navy Jack consists of 13 alternating red and white horizontal stripes. Unlike the national emblem, however, it has no canton with 50 stars. Instead, it has a Timber Rattlesnake in a diagonal incline from bottom right to top left, towards the hoist side. Underneath the snake is the phrase "Don’t Tread on Me." 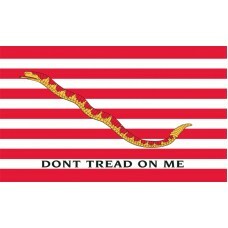 The rattlesnake device and the Don't Tread on Me phrase are references to the American Revolution. They are used on other famous flags from the period, such as the Culpepper Flag. Timber rattlesnakes are indigenous to the eastern USA, which is where British settlers established colonies, and where the Revolutionary War broke out. 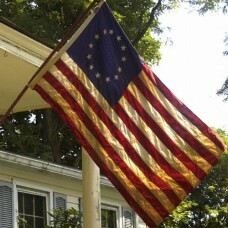 As such, the First Navy Jack was flown from vessels of the Continental Navy. This was one of the American forces which fought against British colonial rule during the Revolution. This first navy was assembled on the Delaware River under the command of Commodore Esek Hopkins. As the navy could not fly the British Union Jack, Hopkins ordered a new design to be created. It is believed that this consisted of the 13 stripes, with the British flag as the canton. Over time, this was abandoned and the rattlesnake adopted as a clear warning to the British Royal Navy. The symbolism of the rattlesnake is significant. Rattlesnakes do not strike unless provoked, or trod on. The message behind this is that the 13 colonies wanted peace, but were ready to fight if necessary. This is the same message the US Navy is trying to project around the modern world. In recent times, the First Navy Jack has been authorized as a patch to be worn by military personnel. This includes army as well as navy service people. Since 2002, it has become a popular addition to uniforms, and is usually worn on the right arm, below the Stars and Stripes. The Jack is also popular with certain sections of US society. It is sometimes flown by citizens opposed to what they see as impositions by local, state or national governments. This includes people opposed to smoking bans in their locality. It has also become popular as a sign of defiance after terrorist attacks.